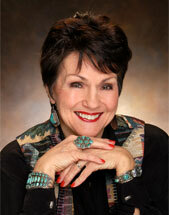 Jane Butel is an internationally recognized authority on the regional cooking of the American Southwest. The daughter and granddaughter of accomplished home economists, Ms. Butel is a cookbook author, teacher and television program host whose most recent television project is “Jane Butel’s Southwestern Kitchen”. Ms. Butel’s interest in Southwestern cooking predates its current widespread popularity by decades. She was the first to write about the cooking style that evolved in the Southwestern border area, and is credited with starting our nation’s love affair with this cuisine. From her first cookbooks, Cocinas de New Mexico (1961) and Favorite Mexican Foods (1965) to her latest, Jane Butel’s Real Women Eat Chiles (2006), she has continued to explore the region’s unique ingredients, recipes and cooking techniques. In all, she has written 18 cookbooks, including six best-sellers. Her background includes executive positions at American Express, General Electric, Con Edison and Public Service Company of New Mexico. At both American Express and GE, she was the first female corporate executive. Though successful in the corporate environment, she wanted both more control over her efforts and more satisfaction from them. In 1983, twenty-five years ago, she founded the Jane Butel School of Cooking in Santa Fe, relocating to Albuquerque in 1993, which was recognized by Bon Appétit magazine as one of the best vacation cooking schools in the world. Gayot.com recognized her Scottsdale school as the best in the US. She also created Jane Butel’s Pecos Valley Spice Company, a trusted source of the unique ingredients critical for authentic Southwestern fare. Her expertise has put her in high demand as a consultant, and she has worked with companies like Del Taco, El Torrito, Zona Rosa and Luxury Hotels. Ms. Butel is listed in Who’s Who in American Women, Outstanding Young Women, Platinum Who’s Who and the World Who’s Who. She is a member of the New York City chapter of Les Dames d’Escoffier.